Public Transit is the live blood of the modern city. It has become more and more apparent that the cities that have robust regional transit options will be the cities that prosper. I am excited about the plans that the Rhode Island Public Transit Administration is drawing up for the first Streetcar line serving downtown in over 60 years. With all the talk of transit going on due to RIPTA’s Core Connector Study, I pulled together the principles below to hopefully inspire the creation of a better plan that supports a more prosperous region that is, of course, a nicer place to live. This is an incomplete list, and it would be great to hear your additions in the comments below. The physical organization of the Metropolitan Providence should be supported by a framework of transportation alternatives. Transit, pedestrian, and bicycle systems should maximize access and mobility throughout the region while reducing dependence upon the automobile. A transit system should support the ongoing development of towns and cities by respecting historical patterns, precedents, and boundaries. 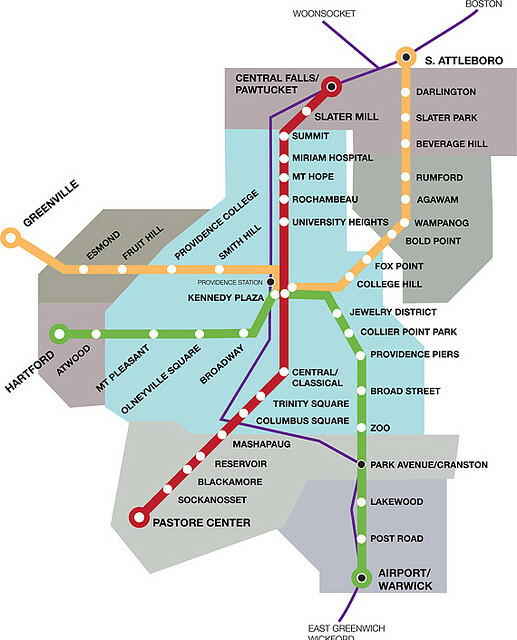 Transit should serve to connect activity centers within the region. Corridors should be located to encourage the redevelopment of existing city fabric. The evolution of suburban development should also be considered when locating these corridors. Failing suburban retail center, big box stores and office parks should be consider retrofit opportunities that would add higher densities if served by transit. Strong connection to regional rail and shipping services is not only an economic necessity, but will provide further alternatives to highway driving for the business and citizens in Providence. Neighborhoods should be compact, pedestrian-friendly, and mixed-use. Districts generally emphasize a special single use, and should follow the principles of neighborhood design when possible. Corridors are regional connectors of neighborhoods and districts; they range from boulevards and rail lines to rivers and parkways. Transit spines should work with these larger linear features to enhance the connections between neighborhoods. Transit corridors, when properly planned and coordinated, will help organize Providence’s metropolitan structure and revitalize the urban core. These corridors should be planned to connect neighborhoods and to provide easy access to the services and destination located in Downtown. Wherever possible, new development shall be sited on underutilized, poorly designed or already developed land. Transit stops should be located in these areas to encourage redevelopment. Future development should be organized based on the principles of a walkable neighborhood with plans for transit integrated into the design. Neighborhoods must be compact, with a range of densities that are compatible with existing places and cultures. Successful transit options require lively, mixed-use urban places. Brownfields shall be redeveloped, using cleanup methods that reduce or eliminate site contaminants and toxicity. Redevelopment of these sites should rely on transit and reduce or eliminate parking requirements. Multiple transit option should be provided to ensure all citizens of Providence have access to jobs, entertainment and recreation. Automobile travel should be discouraged to promote more sustainable forms of mobility. A resilient transportation network requires many nods, stations and multiple opportunities to navigate to a destination. Planners must recognize that people will change their course if needed and the network should provide as many choices as possible. A transit system should be organized around a network of corridors, and thoroughfares. Transferring from one mod to another should be easy and well organized. Expansion of the network should create a web of transit facilities. Providence has a fragmented urbanism which transit should work to connect. The network should provide transportation option within a neighborhood as well as travel between neighborhoods. The design of streets and the entire right-of-way shall be directed at the positive shaping of the public realm to encourage shared pedestrian, bicycle and vehicular use. All transit stops should be designed as permanent amenities to the streetscape. These stations should build on the culture and identity of both the corridor and neighborhood. Development should create a positive public realm that is designed to provide pedestrian comfort and safety. Transit should be integrated within developments and public space to further enhance these aims. Retail and first floor commercial uses are important elements of a mixed use neighborhood. Transit should be planned to enhance the economic development potential of first floor uses that will add life to the street and enhance community safety. Development within a five minute walk of transit should not require parking. The market should dictate if any off street parking is needed based on sales or leasing requirements. Transit infrastructure should respect the character of the neighborhood. The streetscape, including transit facilities, should be designed to improve the pedestrian experience, and enhance the surrounding businesses. For more on smart planning principles click here, here and here. This entry was posted in Urbanism and tagged Planning, Principles, Providence, RIPTA, Streetcars, Transit, Transportation, Urbanism on February 17, 2011 by Russell.